Those tight little swim shorts may actually have a use for more than just aerodynamics in the water. A group of undergraduate students from the Chelsea College of Art & Design took 200 unusable Speedo swimsuits and remade them into the s_pavilion for the London Festival of Architecture, which just ended. The purpose of the project, which we spotted over at Designboom this morning, was to explore issues of sustainability through consideration of the use of materials and the development fabrication processes. 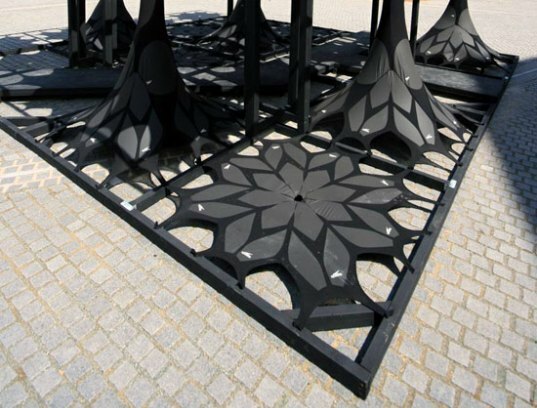 The end result is this hydrophilic and remarkable spandex pavilion. The specific Speedo used is the LZR Racer, which is considered to be the most technologically advanced performance swim suit ever produced. Since the swim suit’s launch in 2008, 90 world records have been broken by racers wearing it. Recently some changes in the rules for competition swimsuits by FINA (Fédération Internationale de Natation), have banned the LZR Racer from competition, which means they are basically obsolete. So Speedo donated 600 LZR Racers to the Chelsea College and the Platform 2 Students, who used 200 of them for their undergraduate summer show, which exhibited at the London Festival of Architecture from June 19th to July 4th. The purpose of the project was to re-use the LZR Racer as an architectural component and to think about sustainability approaches in the design and fabrication process. Digital technologies were utilized to optimize the design and its production process through a collaboration between textile designers, materials engineers and programming engineers. The result is a modern structure composed of metal beams with the groupings of Speedo swim suits stretched between the cross members. 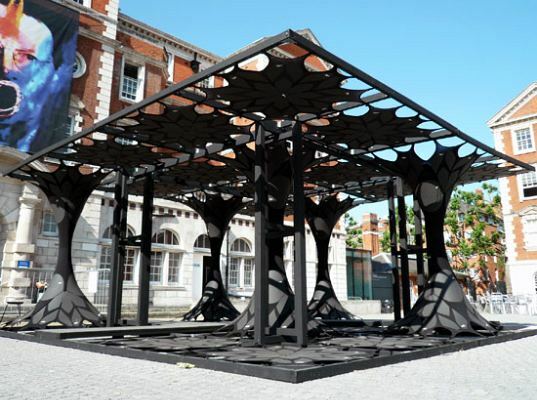 S_Pavilion will the be on display at the London Design Festival from September 18th to the 26th and then temporarily at the Cass Sculpture Foundation near West Sussex.